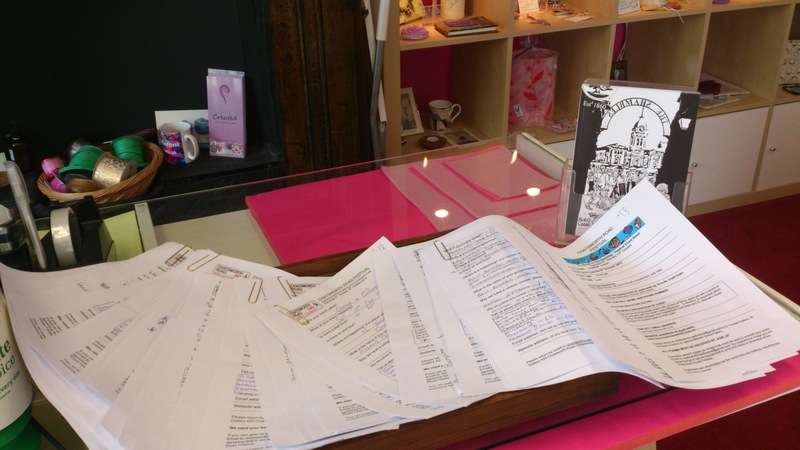 Preparing the festival guide – Chatsworth Road Festival. We’ve been working hard here to prepare the Festival Guide. The information on all these (and more) event forms has gone to Paul Chapman of S40local who prepares the guide. The first draft has been sent to event organisers for them to check details and we will be letting you get hold of a copy soon. The guide is being launched on Saturday 7th September during the Food Market at St Thomas’ Centre. Businesses up and down Chatsworth Road will then get copies of the guide to give out to customers. You can pick one up when you’re out shopping along the Road. Also the Sept/Oct edition of S40local will contain the guide and finally you can download it from here. But not till the 7th September… not long now. This entry was posted in Uncategorized and tagged 2013 festival, festival guide.. Bookmark the permalink.